Seasonal, farm-to-table food, and sustainability are hallmarks of Virginian caterers. 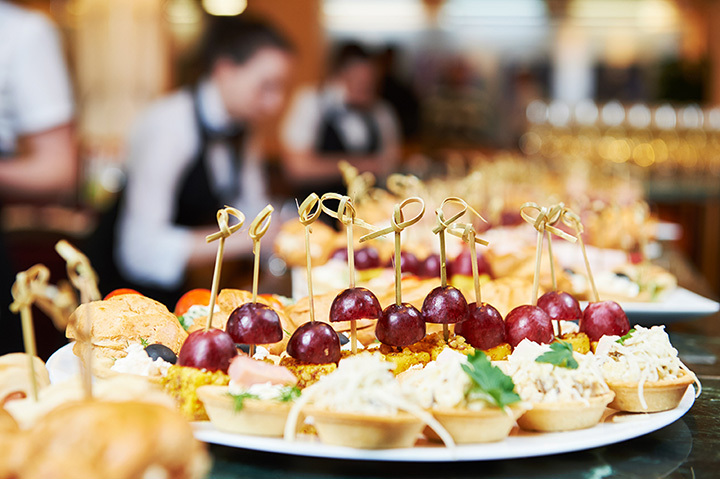 Whether you’re hosting a dinner party, wedding reception, or corporate event, one of the following ten caterers will undoubtedly have what you need. Enjoy the many flavors of southern comfort with one of the following 10 best caterers in the commonwealth. The Goodrich Gourmet Catering Company, services the Richmond and Virginia Beach regions of Virginia, and is the recipient of the 2015 Wedding Wire Couples’ Choice Award. The fine folks at Goodrich Gourmet pride themselves on exceptional service and value. Whether you’re in need of full service for your corporate or private event, or a buffet style wedding, Goodrich is able and willing to help. Choose from an incredible array of hors d’oeuvres, entrees, action stations, children’s menu items, and desserts. Main Event Caterers in Arlington, Virginia is the 2010 recipient of the Caterer of the Year Award, and have received recognition for their 100 percent carbon compensated and wind power use, as well as their delicious food. Main Event Caterers services events with as few as 20 guests up to 2500, transforming “office blocks, beautiful gardens, gilded museums, open-air rooftops and urban warehouses into the perfect space for your guests.” The food is remarkable, and includes dishes such as wine braised short ribs, tortellini soup, sesame crusted salmon, baked mac and cheese, and much, much more. Working out of Alexandria, Virginia, La Prima Catering services Virginia, Maryland, Washington D.C., and Pennsylvania with catering for every occasion. The recipient of the Maryland Green Registry Leadership Award, Biz Bash Top Event Innovator award, and many more, La Prima caters breakfast, sandwiches and boxed lunches, appetizers, entrees, barbecue, soups, salads, and desserts. While not the highest-end food available, La Prima is a solid choice for any more casual-style event. Hank’s Grille and Bar in McGaheysville and Dayton has been in business for 18 years, and is as dedicated as ever to delicious upscale southern cuisine. Whether you are scheduling a corporate event for 1,000 or have a sit-down dinner party planned for 50, Hank’s is happy to help. Pick from the full-service catering menu to the small group packaged, designed for more intimate gatherings. Barbecue is their bread and butter, but don’t miss out on the rest of their fantastic menu. Real Food Catering and Lunch makes each menu custom for your specific event, instead of preselected menus that may not fit. Real Food takes into account available seasonal ingredients, location of your event, and your budget. Buffet options are available, as are multi-course dinners, and cocktail party menus. Dishes include roasted chicken consommé with smoked bacon and croutons, warm wild mushroom salad with frisee greens, poached egg and herbed balsamic reduction, and molasses-bourbon glazed quail on baby greens with roasted sweet potatoes. Groovin’ Gourmets in Richmond, Virginia, is a full-service caterer that began in 1999. Available for corporate events, cocktail parties, and wedding receptions, Groovin’ Gourmets aims to provide food that eases “your mind and reflect your soul—long after the meal is over.” Groovin’ is the recipient of many accolades, including Virginia Living Best of Virginia, Style Weekly Best of Richmond, and many more. Order online for easy access. Particularly interesting is the Food Not Flowers Menu, meant to be sent as a gift instead of flowers to grieving friends and family. Choose from chicken, beef, fish, casserole, and starch entrees, among others. C&O Restaurant in Charlottesville, Virginia has been in business for over thirty years, and have offered catering for just as long. While they claim weddings are their strong suit, they are available for all kinds of events, including rehearsal dinners, reunion parties, Greek life events, or “other.” Choose from buffet, family style, seated, stations, or cocktails, along with your beverage preferences. The staff will help with all the fine details, so worry not. Silver Spoon Catering is the Fairfax go-to for corporate catering, corporate event catering, and social events. The recipient of over 10 industry awards, the female owners bring their diverse backgrounds to the atmosphere, mood, and flavor of their food. Check out their breakfast and lunch catering options as well as mix grills, hot entrees, afternoon snacks, and desserts, as well as complete menus. The menu is vast and diverse, so make sure to read it closely. Carrot Tree Kitchens, headquartered in Williamsburg, Virginia, services the Historic Triangle of Williamsburg, Yorktown, and Jamestown. Available for group lunches, business luncheons, receptions, and social events, Carrot Tree Kitchens is happy to help. Carrot Tree is a bakery first and foremost, so their desserts are particularly desirable. BluSage Catering in Woodbridge, Virginia has serviced the Northern Virginia and Washington D.C. areas since 1989. BluSage is available for corporate events, weddings, private parties, and barbecues. Washingtonian Magazine, The Knot, and Wedding Wire, along with many other outlets, have praised BluSage’s catering. The menu is constantly being updated and revised with new, seasonal items. Contact BluSage via their website for a quote and most up-to-date menu options.